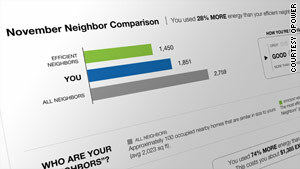 OPOWER, a software company, gives energy users a report that compares their efficiency to that of neighbors. (CNN) -- Information is power, but does information -- by itself -- actually make people change their behavior? Not often, says BJ Fogg, director of the Persuasive Technology Lab at Stanford University. "For all the discussion and hype about living in environmentally friendly ways, few people are seeing information and then changing their behavior based on that information," he said. "They've got many other things to worry about in their lives that are much more urgent than 'Let me figure out how to stop driving to work.' "
So is all hope lost? Not exactly. A host of gadgets and Web apps aim, essentially, to guilt and peer pressure us into being better people -- in spurts. These "persuasive technologies" have various aims: Some want people to move more so they can lose weight (check out these health apps); others are designed to promote energy efficiency through neighborhood peer pressure. The best examples, Fogg said, nudge people to do something simple that they wish they were doing anyway. Here are five persuasive tech companies and products to keep an eye on. This list is based primarily on interviews with Fogg and University of Washington Ph.D. candidate Jon Froehlich, who wrote a paper titled "The Design of Eco-Feedback Technology," and who is designing a prototype system to track and display home water consumption. Think you don't care what your neighbors are up to? OPOWER, a software company that promotes home energy efficiency, bets you do. Instead of showing you a plain power bill, OPOWER collects energy data from the home and displays it in a chart that compares your energy use to that of your neighbors in aggregate. Such exposure causes 60 to 80 percent of people to change their energy behaviors, the company says. The company puts a "smiley face" on the energy-consumption readouts of people who used relatively less energy than their neighbors. The service is available through more than 30 utility companies, and users can get their energy data in online reports, through smartphones or on home display units. About 1.5 million people use the service now, said Ogi Kavazovic, an OPOWER spokesman. "If we could take this nationwide -- and there's no reason why we can't -- we can take 3 million homes off the grid and have as much impact as the entire renewable [energy] sector," he said. An MIT fellow and NYU economics professor, Hunt Allcott, found OPOWER's energy reports lead to about a 2 percent reduction in energy consumption, although those behavior changes may not last over time, the report says. Imoveyou.com is the social network designed to persuade people to exercise more often by engaging them in quick "if/then" challenges with friends. A user might type a challenge like this into the site: "I will walk the dog for 20 minutes if you will ride a unicycle around the block." The person who has been challenged is notified by Facebook, Twitter or e-mail, and can accept or reject the challenge. Fogg said the idea is likely to be persuasive because it encourages people to act as soon as possible, and it notifies them about the challenges wherever they are. It also engages people in a bit of competition. Technologists have been working for years on ways to make people to remember to take their medicine on time. Few have been able to persuade people to stick to their daily medication regimens more effectively -- or more simply -- than GlowCaps, Fogg said. The idea is simple: A special cap fits on top of a standard pill bottle, and it lights up when the patient needs to take his or her medicine. The caps are also wireless-enabled and send reports about how well a person is doing at sticking to his or her medication schedule over cellular networks, according to a company spokeswoman. The company claims that it is 86 percent effective at getting people to remember to take their doses, a figure that is "astounding" in the field of persuasive tech, according to Fogg. That number is based on a 50-person trial. Weigh yourself on the Withings Wi-Fi-enabled scale, and if you choose, all of your Twitter followers or Facebook friends will be instantly blasted with your current weight. Such public display of weight loss or gain could be incentive enough to get people moving. Or, if you're not up for that, the scale can log your weight on a website only you can access. It's kind of like putting everyone on "The Biggest Loser." Display technologies aim to change how people drive. In hybrid cars, including the Toyota Prius and Ford Fusion hybrid, display panels that tell the driver how efficiently he or she is driving at any given moment. The Prius plots this information on a bar graph, as current miles per gallon. The Ford Fusion goes a step further, causing a digital plant to grow (or die) on the dashboard screen as a person's driving efficiency increases or decreases. Fogg says these ideas are effective because they give people information on how to improve their gas mileage at exactly the moment when they're empowered to do something about it: while they're driving. That makes it easy to change right away. "It is giving you moment-by-moment feedback and triggering you" to do something about it, he said. No one wants a dead plant on their dash. Someone might see it.